Johnston County History background sheet. Johnston County was created from Craven County on June 28, 1746, and named in honor of Gabriel Johnston, North Carolina’s colonial governor at the time. The following counties were subsequently derived from all or part of original Johnston: Orange, now Durham (1752); Dobbs, later divided into Wayne, Greene, Lenior (1758); Wake (1771); and Wilson (1855). Ranking 10th in size among North Carolina’s 100 counties, Johnston’s land area is about 792 square miles. Noted as the fastest growing county in the state, Johnston’s population is approximately 175,000. Johnston figured prominently in the early affairs of North Carolina during its transition from colony to state. Much groundwork was laid for the colony’s role in the American Revolution when the 13-member Provincial Council held its first two sessions in 1755 at Johnston Court House (chartered as Smithfield in 1777). Smithfield was also the site of the General Assembly’s 1779 session. Between 1779 and 1788, Johnston’s county seat was several times a contender for the location of the state capitol. Since the very beginning, agriculture has been the leading economical pursuit. Before the civil war, production was kept primarily at a subsistence level. From the 1870s to the 1930s, Johnston was one of North Carolina’s leading cotton counties. Since the Great Depression, the county has been a leader in flue-cured tobacco and sweet potato production. In addition, it ranks first in the state in the number of operating farms. Johnston’s educational system dates back to the Smithfield Academy, which was established in 1812 and drew teachers bearing degrees from such distinguished universities as Glasgow and Harvard. Numerous other private schools flourished here in the nineteenth and early twentieth centuries before the first public high schools were started. The first public schools were established in the early 1840s after the General Assembly passed enabling legislation to provide county tax support for schools. The New York-based American Missionary Association began the first school for blacks in Smithfield about 1886. The coming of railroads in the 1850s and the 1880s gave rise to eight new towns: Princeton, Clayton, Selma, Pine Level, Benson, Kenly, Four Oaks, and Micro. Manufacturing industries existed on a small scale in Johnston before the 20th Century, the most noteworthy in that era being turpentine distilleries and lumber mills. At the turn of the century, local investors established textile mills in several towns to provide employment for many local residents through the first half of the century. A post-World War II population decline spurred an industrial recruitment campaign that has given the county a more diverse industrial base, including textiles, electronics, pharmacology, biotechnology, and assembly of durable goods. Since 1960, a booming tourist trade has evolved, particularly along the north-south Interstate 95 corridor. 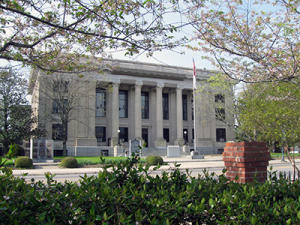 Johnston County has been home to several notable figures. Two governors, Benjamin Williams of North Carolina and William Cary Renfrow of Oklahoma, were born here. Lunsford Richardson, inventor of Vick’s VapoRub, grew up in northern Johnston and operated a drug store in Selma in the late 19th Century before relocating to Greensboro. William E. Dodd, a noted historian and U.S. Ambassador to Germany during Hitler’s reign, grew up near Clayton. The internationally known actress Ava Gardner was born and reared in eastern Johnston’s Brogden Community. Although she lived most of her life elsewhere, she was buried in Smithfield.